Let’s pretend it’s Monday. It’s more in line with how I feel anyway! I do have a verse this week, I’m just late in posting it. I probably take this passage for granted; I can’t think of a time when I didn’t know it, but when I read it today on its own I was touched by what a beautiful beginning it is for God’s Word. It’s probably obvious that I am operating under the assumption that the passage above is true, I just want to state that this is something I have thought through. In my 31 years I have had plenty of opportunities to engage with differing opinions on just how true this passage is, whether through reading secular writings on the subject or through discussion with others. 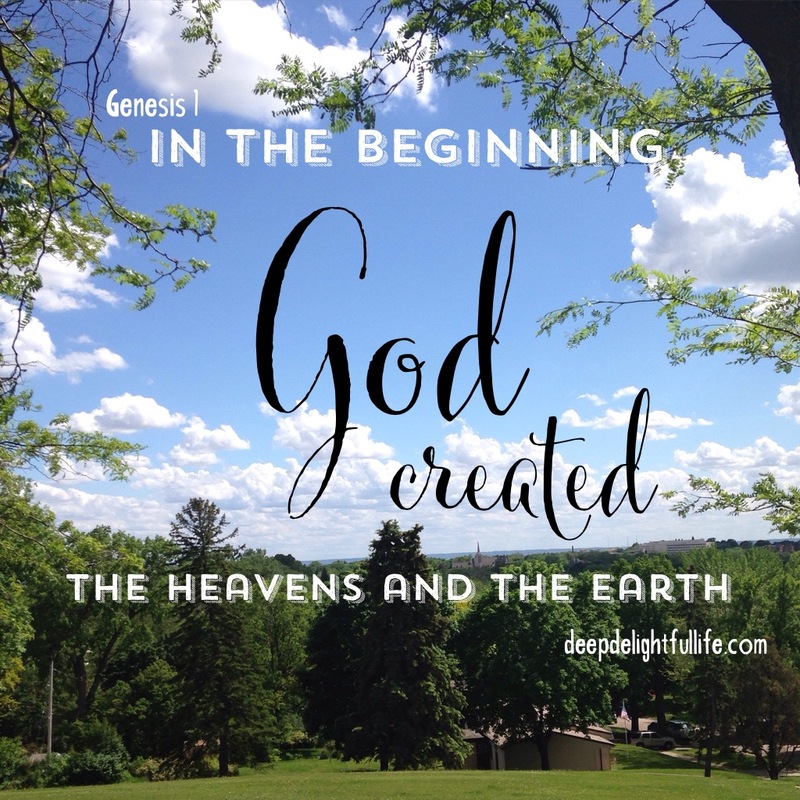 For what it’s worth (because I am relatively puny and insignificant), I have come to the conclusion that God did, indeed, speak our world into existence from nothing (ex nihilo). Obviously I wasn’t there– none of us was– so I guess I can’t technically know for sure. But the longer I live and the more I learn about the world, the more I am convinced that there must be a creator. The conditions are too precariously perfect, the creatures too strange and wonderful, our ecosystems too delicately intertwined for me to believe that all of this emerged accidentally. I hope there is a movie of the creation process playing on a loop when I get to heaven because I would love to see how it was actually done! For now, on this side of eternity, with so many other issues and questions and work that needs to be done in my heart, I am content with knowing that God spoke the world into existence. It is not always in the forefront of my mind, but it is an undercurrent-level knowledge that supports me through life’s journey. This passage assures me that God is powerful enough to be our creator. He is Spirit, he is other, he is holy, he is original. He didn’t need permission or help, he didn’t agonize about the order in which he should create things, he just did it because his power and will are perfect. It brought him joy. And he started with light. This questioning of Job by God goes on for a couple of chapters, and is worth reading. Job’s response (spoiler alert) is one of confession and repentance, a lesson I want to heed. I am often awestruck by the beauty of creation. I feel it when gaze up at a blue sky with fluffy white clouds or watch tiny snowflakes gather on a windowsill. I feel it when I watch a seed sprout or a flower bloom over the course of a few days, and even when I see insects meandering through my garden, taking nourishment and shelter among blossoms, stems and leaves. I recently had the opportunity to see a lot of God’s creation when we drove from Iowa to Tennessee and back. I saw so many different trees, clouds, grasses, critters (some dead- sad), and felt different kinds of weather (mostly heat). I try to revel in that awestruck feeling and enjoy a moment of appreciating nature as it was created, but as I contemplate Genesis 1:1-3 this week I’m encouraged by the Spirit to take it a step further and also practice humility in that moment. I want to remember that God is creator and sustainer, present with me and you and every other part of this world– his world– that he loves. I want to respond not only with wonder, but with confession and repentance. I pray that this process will become a new connection in my mind when I read or hear this passage from Genesis. As always, I would love to hear any thoughts you have on the subject! I agree, obviously. However, the part that speaks to me is “Let there be light!” Light is so powerful, and there are so many images and feelings that are associated with light. It exposes our true selves. It casts out darkness. It brings life. It encourages and cheers. The verses including light are numerous in the Bible. And, most importantly, Jesus is the light of the world. I love that part, too. 🙂 Light was the first gift God gave to creation. It would be interesting to do a study on the use of light throughout the Bible! That would be both a fun and intense study!